The effectiveness of your product is sustainable through the Eagle Wright approach. Eagle Wright labels are manufactured with quality materials to match the needs of our clients. At Eagle Wright we believe in taking the time to understand the intended use and life of a label or tag to ensure the Wright solution. 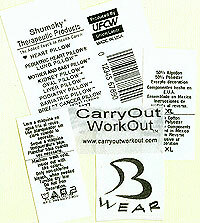 We provide labels & tags in thousands of configurations. We offer graphic solutions for the most complex label and tag designs, including overt and covert security features within your product. Dayton…a community rich in talent and history. The number of inventions patented by Dayton inventors runs into the thousands including the artificial heart, artificial kidney, bar code scanner with configurable video modes, cash register, micro encapsulation, price tag affixing machines, two-way shipping labels and so much more. Innovation runs deep in the heritage of Dayton and lives on today. Dayton is home to the Wright Brothers, the National Museum of the U.S. Air Force (the world’s largest and oldest military aviation museum and the state’s most visited free tourist attraction! ), and Wright Patterson Air Force Base where scientists and engineers at the Air Force Research Laboratories are developing the latest in aerospace technology. Dayton continues to emerge as a global technology hub. Located at one of the busiest crossroads of America, where I-75 north/south meets I-70 east/west, Dayton also boasts an international airport serviced by the major carriers.